EL PALOMAR, Bolivia, Jun 23 2014 (IPS) - Maria Eugenia Calle, a local official in this Andean agricultural community, recently saw the Internet for the first time. Her hometown of El Palomar will host one of about 1,500 telecommunications centres that the Bolivian government plans to open this year in rural areas. They will be served by Tupac Katari 1, a Bolivian satellite launched from China late last year. Socialist President Evo Morales claims that the satellite will make Internet, cell phone service, distance education programmes and over 100 television channels available to everyone in this vast, sparsely populated country. Because Bolivia is landlocked, undersea fibre optic cables do not reach the country, so Bolivians settle for some of the lowest speeds and most expensive connections in the world. Hopes for the satellite are high. In El Palomar’s yet-to-be-opened telecom centre, Calle and a small group of onlookers watched as a reporter booted up a computer to test the signal. “Go to the United States. Show us the White House. Search for Toyota. Search for Real Madrid,” they suggested. Bolivia is the poorest country in South America, and also among the least connected. Only 7.4 percent of inhabitants have access to the Internet at home, by far the fewest on the continent. Because Bolivia is landlocked, undersea fibre optic cables do not reach the country, so Bolivians settle for some of the lowest speeds and most expensive connections in the world. Hopes for the satellite are high. “It’s a dream, isn’t it?” said Calle, 40, El Palomar’s secretary of education. “I’m happy that my children are going to be able to communicate with the United States, other countries – or here in Bolivia, with La Paz, Cochabamba,” she said. With a population of just 10 million and a modest national budget, Bolivia is a strange fit among the 45 nations with their own communications satellite, which are typically either wealthy, heavily populated, or both. However, an increasing number of developing nations are making the investment. In the next two years, Angola, Nicaragua, the Democratic Republic of the Congo, Turkmenistan and Sri Lanka will launch their own satellites. Rural areas bring special challenges for Internet expansion. The cost of installing and maintaining equipment and training people to use new technology is higher farther from cities, said Francisco Proenza, an ICT scholar and visiting professor of Political Science at Pompeu Fabra University in Barcelona. After a 2009 revision, Bolivia’s constitution guaranteed access to basic services including water, electricity, and telecommunications. In addition to the satellite, the Bolivian government has opened over 300 rural telecentres and offered incentives to telecommunications companies willing to build infrastructure in rural zones. According to Ivan Zambrana, director of the Bolivian Space Agency, a national satellite is the most cost-effective way of providing access across Bolivia’s diverse rural terrain, which includes mountains, tropical rainforest and desert. It is also a means of protecting Bolivia’s communication infrastructure from political factors that could restrict access, like the United States’ embargo against ally Cuba. 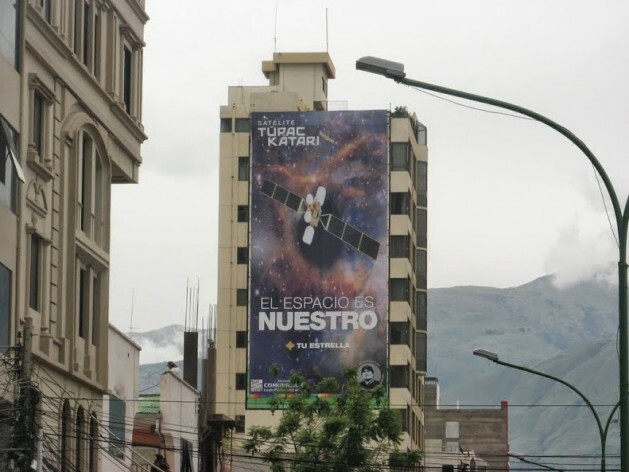 Bolivia’s Ministry of Communications has marketed the satellite aggressively. The agency created a television advertisement, a Facebook and Twitter campaign, and an Android app to promote the project. In the months surrounding the satellite’s launch, billboards reading “Tupac Katari, Your Star” and “Communications Decolonized” were placed in major urban areas throughout the country. 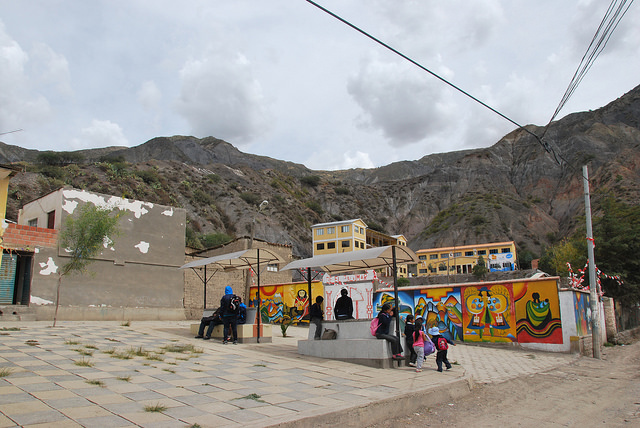 “When we think of Bolivia, we don’t think of technology, we think of rural poverty, but Bolivia has changed,” said Robert Albro, an anthropologist at the American University in Washington who focuses on Bolivia. Despite the fanfare, sceptics of the satellite argue that Bolivia’s priorities are misplaced, especially with alternatives available. Many other countries, including neighbouring Peru, have extended access to rural areas by subsidising the use of existing satellites. Google and Facebook are each considering a fleet of low-flying drones that would provide worldwide Internet connectivity. Until now, Bolivia has spent 10 million dollars annually to lease satellite capacity from foreign providers. To finance Tupac Katari, Bolivia took out a 300 million dollar loan from the Chinese Development Bank, which the government claims will be repaid by satellite revenues within 15 years. “It puzzles me that countries like Bolivia are launching their own satellites,” said Heather Hudson, professor of public policy at the University of Alaska. According to Hudson, existing satellite coverage could meet rural Bolivia’s needs. “It’s like 20 or 25 years ago, when there was a wave among other countries, you had to have your own airline,” she said. Delays and miscommunication have also brought frustration. “The government said that with the Tupac Katari satellite antenna, cell phones, television, the channels and all that would improve. Up until now, it hasn’t been seen,” said Victor Canabini Quispe, a 51-year-old in El Palomar. “I hope the government doesn’t deceive us,” he added. Meanwhile, the public opening of the telecentre in El Palomar has been postponed due to delays in training a community member to run the centre and disputes over who will pay for the inauguration ceremony. If the satellite project succeeds, it could have a big impact on life in rural Bolivia. The satellite will be a “window to the world” for children in rural areas, according to Zambrana, the Bolivian Space Agency chief. He said that many Bolivian children living in high altitude climates have never seen a tree in their lives, and will see one for the first time through satellite-delivered images. In five years, Bolivia “will be more modern, better connected, with more educated citizens. We’re going to be a little richer – or a little less poor,” he commented. The message is one that is resonating in at least one remote part of Bolivia – San Juan de Rosario, a small community in Bolivia’s arid southwest, and a planned telecentre site. Gregoria Oxa Cayo owns a hotel here for tours visiting Salar de Uyuni, the world’s largest salt flats, but by necessity she lives four hours away in the larger town of Uyuni. She grew up in San Juan and her parents still live here, but she needs Internet access to run her hotel and travel agency, and there is none in the isolated desert town. “If there was Internet here, I would live here,” she said.